I recently received the John Paul Pet Care 3 - Pack Oatmeal Starter Kit. Included in the kit is the Oatmeal Shampoo, Oatmeal Conditioning Spray and Ear and Eye Pet Wipes. I love that it is oatmeal, because one of our Shelties has skin sensitivities. This is definitely a good gift idea. 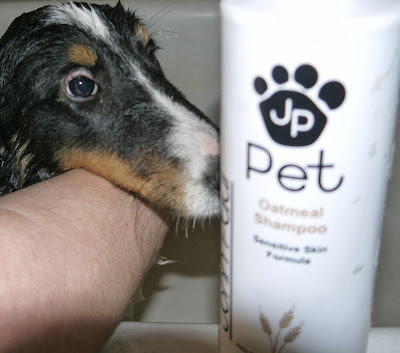 The Oatmeal Shampoo has a cherry almond scent, which is one of my favorites. It is a soft, pleasant scent. We bathed two of our Shelties. It lathered well. Glory enjoyed her bath. She really does well and stands still for the whole event. After rinsing her well, we applied the spray on Oatmeal Conditioning Spray. We of course kept her inside until she was completely dry. Next we bathed Jubilee. These are two of the easiest dogs to bathe. They just stand quietly the whole time. You could feel the softness of their coats after they dried. I will not mention the name, but this works much better than the last shampoo we used that made their coats almost feel sticky or gummy. This product will be on my grooming table, with 6 dogs we are almost always bathing one of them, not to mention we also care for a friends two dogs. 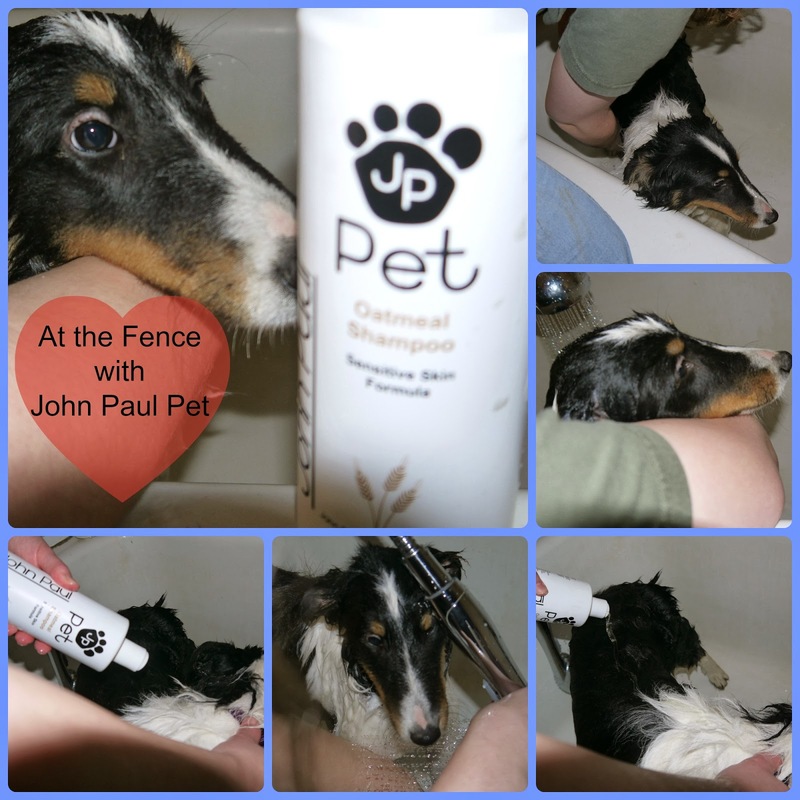 I was impressed with the results of using the John Paul Pet Oatmeal Shampoo and Conditioner. It is their most popular shampoo. I like that it seems to help soothe itchy skin. I always use oatmeal to soothe my children's itchy skin, so why not my dog's. I also like that the Conditioner is a leave in conditioner that helps replenish moisture to the skin while adding a shine to the coat. I also have to say that I feel comfortable using the John Paul Pet up to once a week if I have to as it is so gentle on our dog's coat. With winter setting in here and of course snow, sometimes we get a little muddy and need an extra bath. The Ear and Eye Wipes are going to be staying right near our back door. Perfect for a quick clean up after we have been outside. We can use these for wiping feet, or cleaning faces. Perfect for just a quick rub down or clean up. The website and products state that each of these were tested on humans first! 30 years ago John Paul DeJoria, co-founder of John Paul Mitchell Systems, revolutionized the professional salon industry by banning animal testing for his line of hair products. 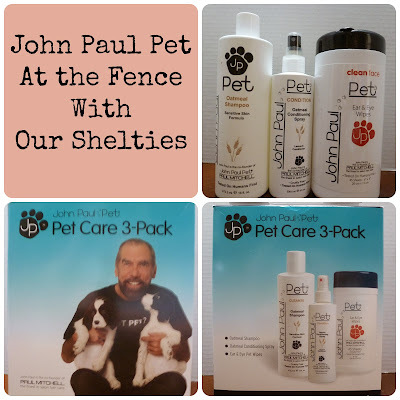 John Paul’s in-depth expertise in hair and skin care formulations also led to research in new standards for pet grooming and hygiene, which lead to the creation of John Paul Pet shampoos, conditioners, sprays and pet wipes. What a great gift idea this is for anyone you know with a dog. John Paul Pet also has a line for cats and equine. Think about adding the John Paul Pet care line to your dog's grooming routine. One winner will receive a John Paul Pet Oatmeal Starter kit. Thanks for stopping by today and please share this giveaway with your friends. Disclosure: I received no monetary compensation for this post. I did receive product for review purposes. All quotes in red are taken from the sponsor's website or email. All thoughts and opinions are my own. I like the John Paul Pet Tea Tree Pack. My Frenchie has sensitive skin. I like the Waterless Foam Shampoo. My dogs hate bath time and a dry shampoo would be awesome for them! I would like to try the Waterless Foam Shampoo. My dogs hate bathtime and a dry shampoo would be amazing. I'd like to try the Super Bright Shampoo. I also like the dog wipes. The waterless foaming shampoo sounds really interesting!! 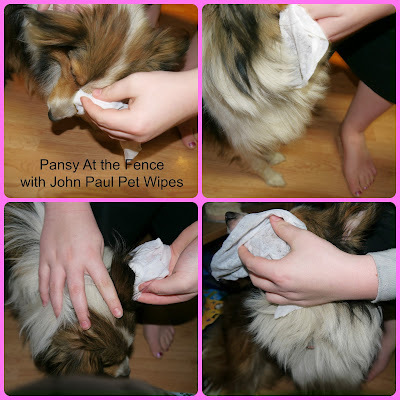 I would love to try the Full Body & Paw Dog Wipes! I have shelties too and like yours one of mine has sensitive skin so I'm definitely interested in the oatmeal products but another couple of things that I would love to try are the full body and paw wipes and the waterless foam shampoo, both products which would be great for freshening up/minor cleaning in between baths. I'd love to in to try these great products for my babies. Thanks so much for the chance to win! I would like to try the ultra bright dog care products. I would like to try the John Paul Pet Ear & Eye Wipes for my Boston Terriers! I'd also really like to try their tea tree oil pack. I would like to try Full Body & Paw Wipes. I like the Awapoochi Conditioning Rinse with Shine Memory.